Insulatard pre-filled pens (InnoLet), penfill cartridges (for use with Novopen 3) and vials all contain human isophane insulin. They are used to treat diabetes. 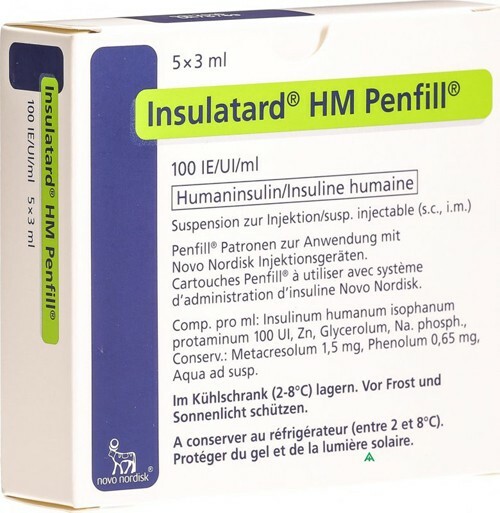 Insulatard contains a type of insulin called isophane insulin. This is known as an intermediate-acting insulin. When injected under the skin it starts to work within 1 to 2 hours and its effects last for about 16 to 24 hours. It helps to give a background control of blood glucose throughout the day. Isophane insulin is normally used in combination with a short-acting insulin, which is given before meals to control the spikes in blood sugar levels that occur after eating. Insulatard injections are usually given under the skin of the upper arms, thighs, buttocks, or abdomen. You should take care to make sure that the injection does not enter a blood vessel. The injection may start to start to work at different speeds depending on the site you use and various other factors, such as if you have been doing exercise. In general, injections into the abdomen start to work quicker than those given in other areas. You shouldn't massage the injection area after administering an injection. Allergic reactions such as redness or hives (urticaria). How do I store Insulatard? Pre-filled pens: Unused pre-filled pens should be stored in a refrigerator at 2-8°C. Do not freeze. Keep the pen in the outer carton to protect from light. Once in use, the pens should be kept out of the fridge, below 30°C. They can be used for up to six weeks. The pen cap must be put back on the pen after each injection in order to protect from light. The pens should not be stored with the needle attached and should not be kept in the fridge once in use. Cartridges: Before use, cartridges should be stored in a refrigerator at 2-8°C. Do not freeze. Keep the cartridges in the outer carton to protect from light. Once in use, the pen with the inserted cartridge should be kept out of the fridge, below 30°C. It can be used for up to six weeks. The pen cap must be put back on the pen after each injection in order to protect from light. The pen should not be stored with the needle attached. Vials: Before use, vials should be stored in a refrigerator at 2-8°C. Do not freeze. Keep the vial in the outer carton in order to protect from light. Once in use, the vial should be kept out of the fridge, below 25°C. It can be used for up to six weeks. Again, keep it in the outer carton to protect it from light.